Delicious - I make a load of these when red peppers are plentiful- served best room temperature. Might have ignored this little recipe if not for the seductive picture. A colorful winner. 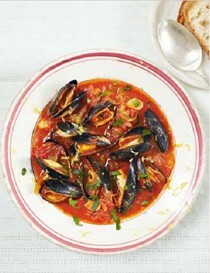 Just a very pleasant soup and easy to make- has very subtle flavours. Very, very good. It is an unusual way of cooking rice for me. The basmati rice was boiled in a lot of water for 7 minutes, the rinsed to get rid of the starch and drained. Veal or fish stock (I used shrimp stock), pepper, sausage, olive oil and paprika were then added and brought to a simmer on the stove top, it was then finished off in the oven. I only used half the amount of olive oil in the rice as the chorizo already is quite fatty and I didn't want my rice to be greasy. I also did not finish the rice in the oven, I finished cooking the rice on my simmer burner. The amount of stock called for was spot on. the rice was perfect and very tasty on its own. The mussels and shrimps were each cooked separately and added to the rice. Simple and quick. Surprisingly, even though I did not have time to let the herbs infuse them, the few sprigs of fennel leaves, thymes and bay leaves flavored the chops well and filled the kitchen with their wonderful aroma while in the oven. Lured by the luscious photo, made my first summer pudding. No currants (birds nab them) so subbed colorful blueberries. Used a Japanese bread with a bit of sugar in it. Berries were delicious, but I guess I'm just not a fan of mushy bread with my fruit. (Glad I chose this recipe rather than one with multi-layers of bread.) Slipped a knife around edge, no problem un-molding, even without plastic wrap. Pretty though. While Elizabeth David’s recipes cannot be improved on, this illustrated collection of her greatest hits will hit the spot for any cookbook lover who has yet to be seduced by her peerless taste. Reissuing recipes that are decades old and making no apology for it is a risky move...As it is, this curious, elegant hybrid of old-school and new-school recipes would be a shame to overlook. Sometimes something subtle can have just as strong an effect as something that slams you in the face....its exceptionally nuanced...fragrance and flavor from a simple spice-infused cinnamon butter. Legendary cook Elizabeth David is the woman who changed the face of British cooking. She introduced a dreary post-war Britain to the sun-drenched culinary delights of the Mediterranean; to foods like olive oil and pasta, artichokes and fresh herbs - foods that have become the staples of our diets today. Her recipes brought colour and life into kitchens everywhere, yet her books never contained any photographs. Now, published for the first time, is this beautiful new collection of her most inspiring, everyday recipes with full-colour photography throughout. 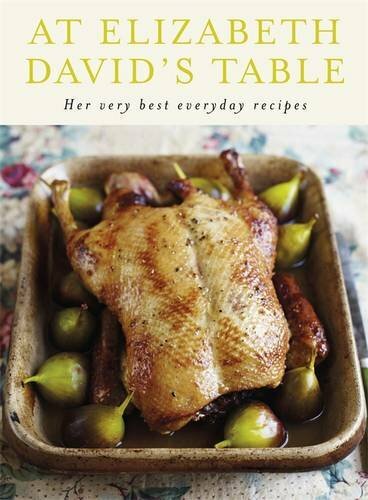 Published to celebrate the 60th anniversary of Elizabeth's first book, "At Elizabeth David's Table" has twelve chapters guiding the reader from tasty soups and starters, through to meat, fish and desserts. Sections on successful bread making, as well as more extravagant dishes, ensure that this will become the cookery bible that you will turn to, time and time again. Interspersed throughout the book are some of Elizabeth's short essays - from how to cook 'fast and fresh' using storecupboard ingredients, to evocative portraits of French and Italian markets.